Please Contact Us for rates. Rates vary based on availability, time of year, and day of the week. We are competitively priced. We have an excellent reputation in the industry with many referrals coming from past clients, venues and event planners. We are highly rated and reviewed. Note: There is a 3-hour minimum charge for all events. When purchasing the Silver Package (with the Prop Package add-on), Gold Package, or Platinum Package, you may choose from one of the following packages. After the event you and your guests get to keep all the Props in the Package. Bring the endless summer to your event! Guests will enjoy our beach prop package. This theme is perfect for that winter event where guests can dream that they are in a tropical paradise. We have plenty of props from under the sea to a luau on the beach! This package has around 50 pieces and includes beachcomber hats, a sombrero, a cheeseburger hat, assorted leis, sun glasses and inflatables! Let the fun roll with these entertaining props. 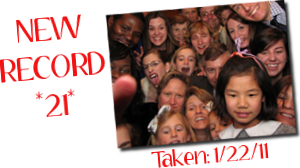 Our party theme will liven up every photo. This package includes various witty hats and wigs, Mardi Gras boas, silly inflatables, funky glasses, and more! Our creative and humorous props will keep your guests amused for hours! The standard set has around 30 pieces and the deluxe set, which includes 12 photo booth props on a stick, has around 50 pieces. If your wedding or event has a specific theme, let us know! We can customize your prop package to match your events theme. Based on the them this set will include around 40 total pieces. The following samples are your print choices. Each session of either the 3 or 4 pose photo strips produces 2 strips. Each session of the postcard produces 1 copy. 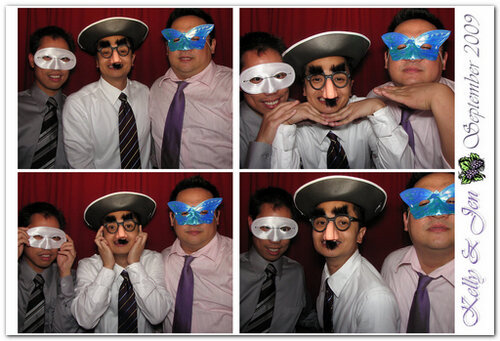 The 4 pose strip is the most common used and are popular for weddings and private parties. The 3 pose strip is popular for corporate and charity events, as it provides more graphic and text space. All options come with customized graphic and text. Choice of text and graphic display on any print are included in every package price. We have hundreds of fonts available to us and almost any type of graphic. Our graphic designer will customize your graphic and text to meet your needs and WOW your guests. You can combine two graphics onto a print, assuming that it looks good and it fits along with the text. Our graphic designer will email you a sample for approval about 7-10 days prior to your event. You also have the option of sending us a graphic to use, such as an organization logo or monogram. On the contract, use codes when specifying a graphic to us. Use A1 if you will provide the graphic. Use A2 if you want us to use something not shown below that will be based on your description. Below are some of our graphics. Please click the categories plus (+) sign to expand and view the graphics in that category. Once you are finished viewing that category, you may click the minus (-) sign to minimize the category for a better visual of our other categories. If you do not see a graphic that meets your needs in our select categories, you may click ALL to view more options. The outside of our photo booths are elegant and the decor fits any occasion or setting. 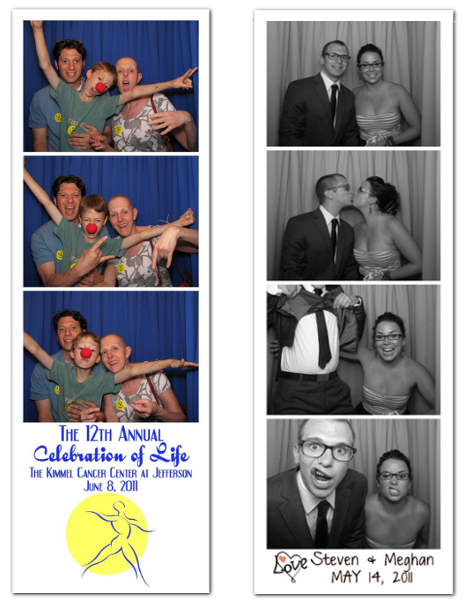 Pictures of our photo booths can be found on the Why Rent page. You can choose either an open look or a closed look. With the closed look, the photo booth will have theater style curtains draped over it. If you wish to customize the outside of the photo booth for your event please contact us at 302-388-3619 and we would be happy to go over options with you. There may be an extra charge involved. We have 6 background colors for the photos: Red, Silver, Blue, Light Blue, Pink, and Lilac. Once again, if you want to deviate from this, please contact us and we can go over options. We will raise any red flags concerning color choices, as some colors are not conducive to good portraits. Again, there may be an extra charge involved. We offer discounts based upon availability, time of year and day of the week. Periodically we will also offer promotions to which you must register your email with us to receive, you can do that on the Contact Us page. Or you can keep checking our web-site for announcements concerning any promotions. And lastly, we offer school, church and non-profit discounts, please call us at (302) 388-3619 for details. The Wilmington Photo Booth Co. requires a signed contract and up to 50% of the total price as the deposit to secure the Photo Booth for your event. 3 weeks prior to the event the final payment is due. Invoices will be mailed or e-mailed upon receipt of signed contract and deposit. Contact Us for the specific deposit amount for your event. Please Contact Us if you have questions or if you want to reserve your date. Or you may check availability by clicking here.